You've seen your child play Mario Kart, right? He skids across the track like a hockey puck. He bangs into other racers. He shoots turtle shells across the track like some kind of maniac. He also drops banana peels on the road every chance he gets. Hen, he performs his patented Luigi Death Stare to intimidate the competition. It's probably a smart idea to keep him away from getting behind the steering wheel of a real vehicle in the near future. But you can still help him bring his passion for Mario Kart racing into the real world. It's best to start your young little speedster on a kart that won't let him terrorize the roads. You know, start him with something that doesn't have an engine under the hood! 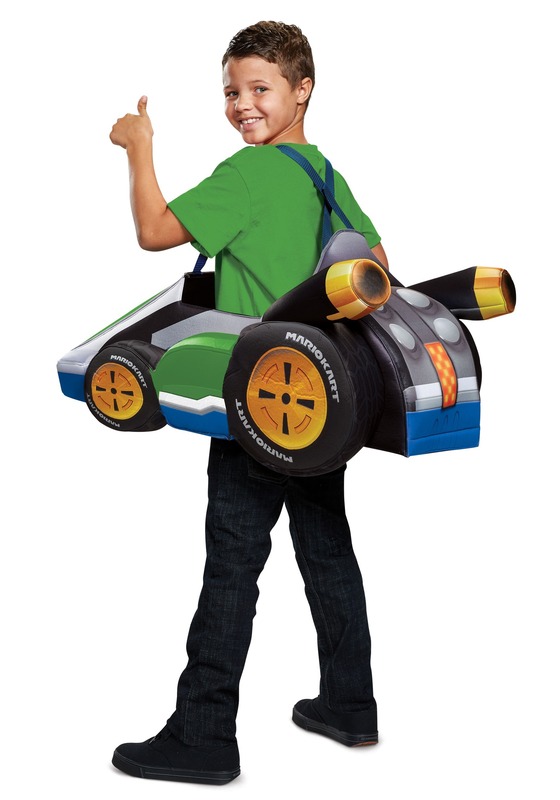 That's why you want him to start his real-life karting career in this Super Mario Kart Luigi Kart Ride In costume. 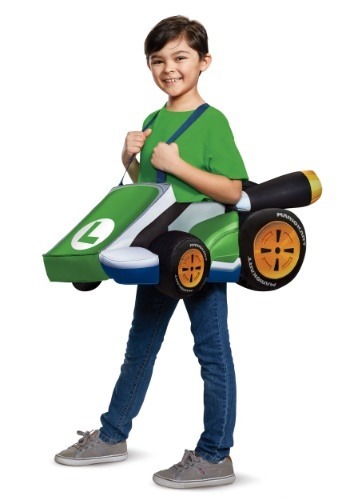 This kart costume works as both a great stand-alone costume, or as an addition to your child's Super Mario Bros Luigi costume. The kart fits around your child's shoulder with straps. The main piece is made of a lightweight material, so your child should have no problem carrying it around during a party, or while trick or treating. The exterior is bright green with black and gold accents, and it even comes with a big "L" on the front of the kart. Once your child is strapped into this Luigi kart costume, he'll be ready to race a few laps around the track. Pair it with our Luigi costume, or simply dress him in a green shirt for an easy outfit. Just make sure you keep all turtle shells, banana peels, and boomerangs away from him! He won't hesitate to use them on the track!